FACute – All your questions answered! One quarter of all mammal species are rodents. Rodents have four big teeth called incisors at the front of their mouths. Rodent teeth grow throughout their lives and are razor sharp. ADVICE: don’t get bitten by a rodent. Some rodents, like beavers, can actually cut down trees with their super-sharp teeth. 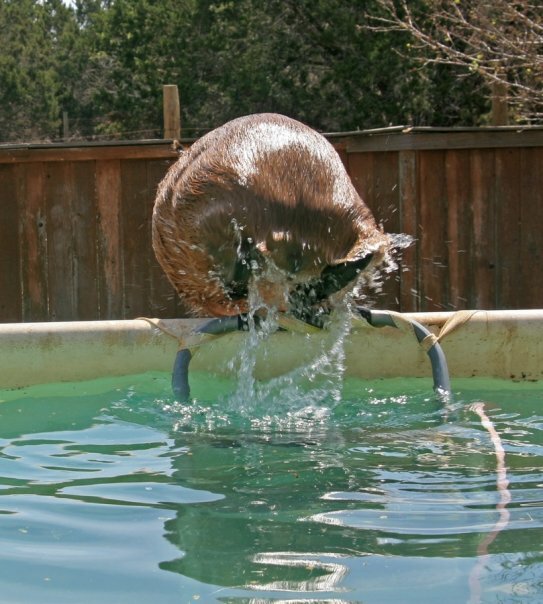 Beavers are the world’s second largest rodents. All rodents have bacteria that can digest cellulose in their gut. Cellulose is the stuff that makes the cell walls of plants. Mammals cannot digest it on their own. Some mammals, the ruminants including cows, chew their cud to get the nutrients released by bacteria in their stomachs that digest cellulose. This is like throwing up into your mouth and then eating it again. Rodent bacteria are in their hind gut so must defecate and then eat the poop. Eating poop is called coprophagy. 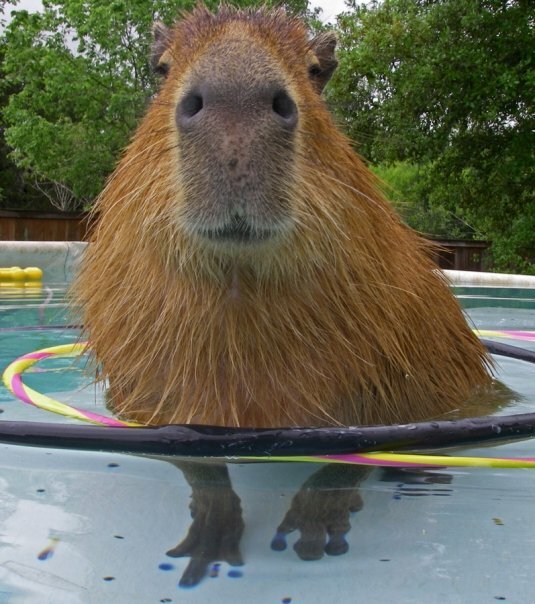 Capybaras are the world’s largest rodents. Our scientific name is Hydochoenus hydrochaeris. We are in a strictly South American group of rodents called the Caviidae. Some of our closest relatives are guinea pigs and maras. 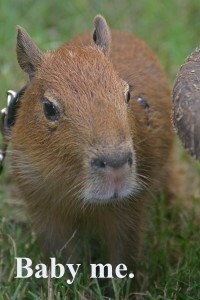 There are some wild capybaras in Louisiana and southern Florida. Baby capybaras can walk as soon as they are born. Capybaras mostly eat grass. We are herbivores. Mostly we poop in the water, but the special poop we eat, we eat directly as it comes out of us on land, not in the water. We have very coarse hair that is also very sparse. You can see skin through it most places. Our fur dries very quickly. We puff up our fur when we are happy. 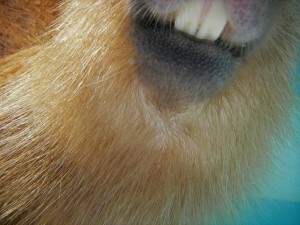 Capybaras have little tiny tails that are just nubs. We can’t move them at all. We like to live in marshes. We have three toes in the back and four in the front. Our main predators are jaguars, anacondas, caiman, crocodiles, large raptors, and people. Our skin is very, very tough so, tragically, we make good leather. 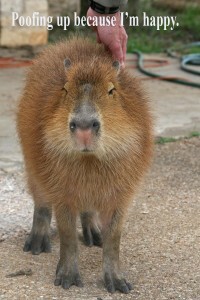 All capybaras are basically the same color. 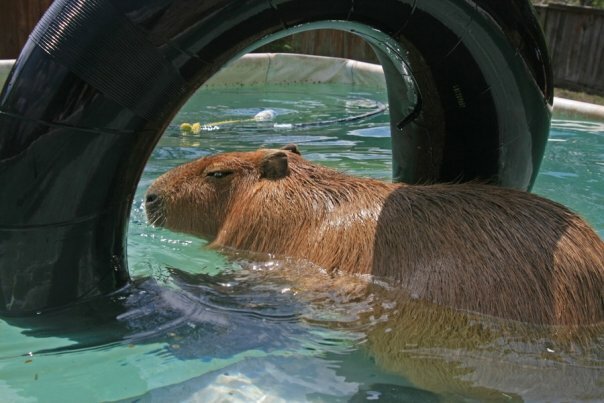 A typical capybara weighs between 120 – 140 lbs. 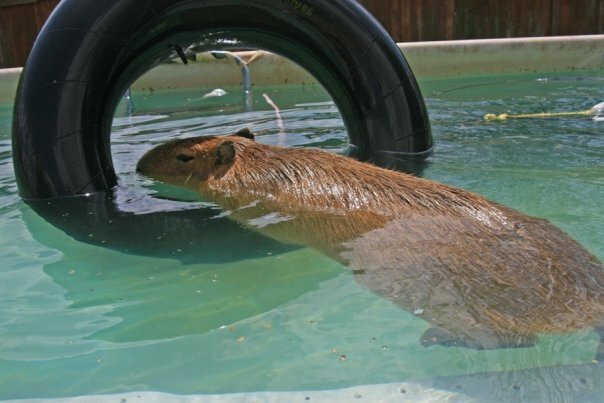 Capybaras live about 12-14 years in captivity and less in the wild. Capybaras live in herds or bands in the wild with one or a few males and several females and babies. I am 3rd or 4th generation captive bred. I was born on July 10, 2007 in Nacogdoches, Texas. My parents are carnies. They go around to small fairs as a sideshow attraction. I was one of five babies in my litter and the only one left when my owner came to pick me out. I was 11 days old when my owner got me and I weighed about 3 lbs. I reached 100 lbs and stayed there at around 18 months of age. I was house-trained from the first day home. My owner just put out a bowl of water for me to go in. My favorite food is blueberry yogurt. I do not like fruit pieces in my yogurt. I have to eat around them. My tongue is so short it doesn’t come out of my mouth so I have to rub my nose on the wall and then lick the excess yogurt off the wall. I will also use a chair for that purpose. I also love fruit popsicles. And best of all, yogurt popsicles. I go swimming every single day at least once, unless it is too cold. Most days I also take a long soak in the bathtub. When I was growing up I went through an aggressive phase and I bit my owner. I am sometimes territorial but I am always very gentle away from home where I don’t think you’re trying to steal my stuff. I can “eep” very loudly but I only do that when my owner abandons me. I like to bark and run up and down the hallway. When I am happiest, I sound like a Geiger counter. When I’m excited, I popcorn like a guinea pig. When the weather is cold, I like to sleep under the covers with my humans. When the weather is hot, I sleep on the floor next to my owner. 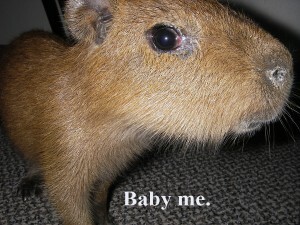 My owner DOES NOT BREED CAPYBARAS! 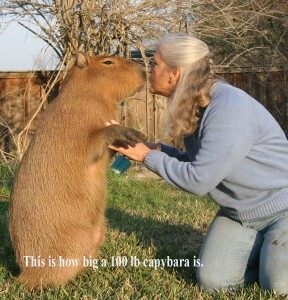 I am her one and only pet capybara and I’d like to keep it that way. 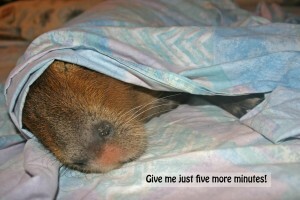 Read my whole blog and watch my YouTube videos at www.YouTube.com/CaplinCapybara. 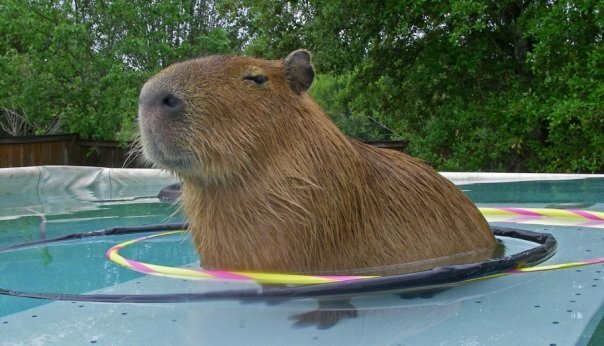 Read Capyboppy by Bill Peet. 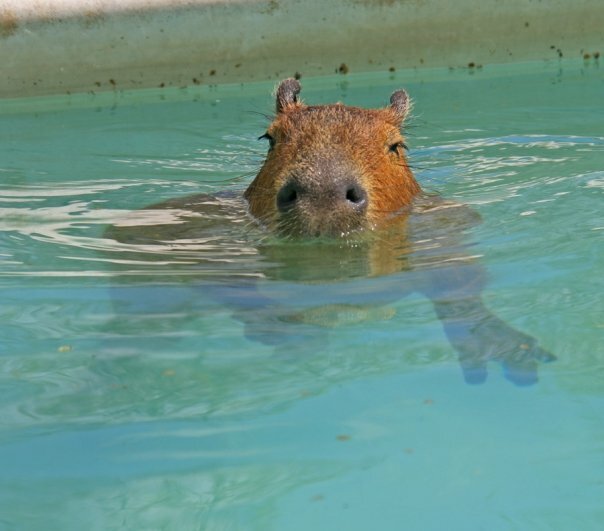 Capybaras are a lot of work, need lots of room and a swimming pool, can be territorial and have big, sharp teeth. We are not the right pet for everyone…or very many people. 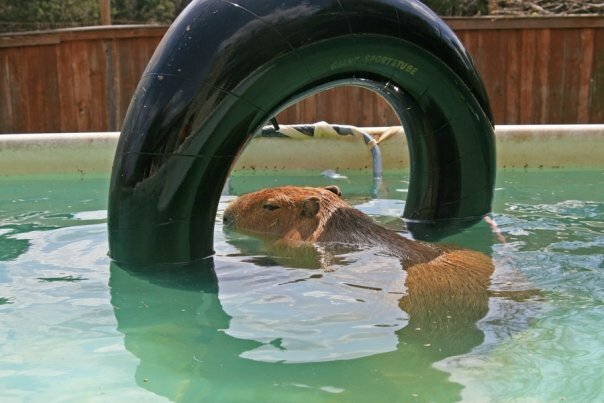 Make sure you have the right facilities to keep a capybara in your climate. Check your local laws and agricultural office to make sure we are legal where you live. 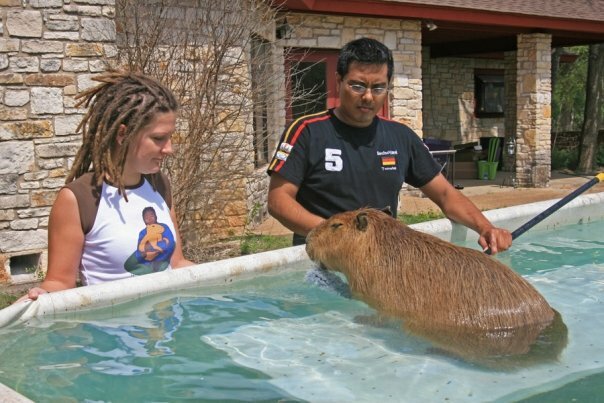 Most “pet” capybaras live outside and are treated more like goats. 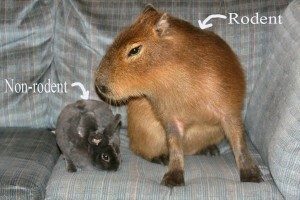 Don’t get a pet capybara if you have young children. We are still wild animals and won’t tolerate half of what a dog or cat will. 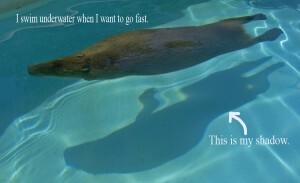 Contact Mary Lee at capybaras.org. She is in Arkansas. Or Justin at Kapi’yva Exotics. He is in Houston. If you are in the UK, you can try Peculiar Pets. You could impress everyone you know just like this girl did. I weighed only 3 lbs in this photo. A cat harness like this one was too big for me. Porcupines are the 3rd largest rodents. Me with my co-pet Seabiscuit when I was 8 months old. I am not a morning animal. This is why we need rain.